Last weekend I had a great time playing radio. Along with half a dozen other families and all our kids we went to spend the Easter weekend at the “mud brick mansion” at Bamarang on the Shoalhaven River, a few km west of Nowra on the south coast of New South Wales. Courtesy of the pod on my car I was able to take quite a few radio bits and pieces along. We enjoyed perfect autumn weather while it rained back home in Sydney! 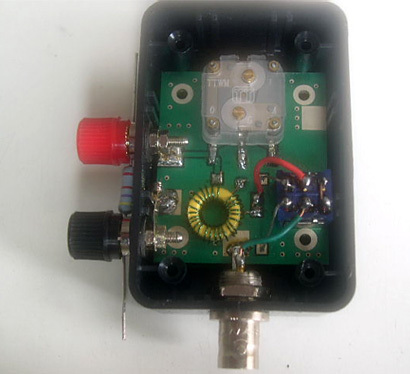 I even managed to build the neat little EFHW (End Fed Half Wave) Tuner designed by Stu, KI6J on a shady verandah. The kit had arrived a few days earlier and I made sure I had everything I needed to build it away from my attic/shack/workshop. In fact the weekend became a sort of trial for field day and a great way to identify the essentials. If there’s a lot of gear on hand an awful amount of time can be wasted deciding which bits to use and how. I was inspired by reports about the EFHW tuner and the appeal of not having to worry about ground radials. What clinched it for me was a photo I saw on one of the (far too many) qrp email groups I try to follow showing a ham on a mountain side beneath his arching squid pole with the little tuner matching the hi-Z of the half-wave antenna to the 50 ohms expectations of the tiny transceiver which was probably an ATS3b. So that was my mission for the weekend. The tuner kit went together in a very short time. Before accepting my order Stu, KI6J sent me a powerpoint of the assembly instructions so I was sure I could handle the construction. The fiddliest bit was the tiny binocular ferrite core transformer for the bridge. Fortunately he provided enough wire in the kit for me to botch it the first time round and do it perfectly the second! After a couple of leisurely hours mostly taken up with drilling holes in a tiny plastic box it was working on the test lash-up. The polyvaricon is delightfully sharp. You tune by dimming the LED – and then switch out the bridge to transmit. I had a 10m (almost 33 feet) squid pole (aka Jackite or crappie pole) with a tiny pulley from a boating store attached to the top with cable ties. I used the guy ropes from my Buddipole setup to hold the pole up straight. It stayed up all weekend. The half wavelength formula in feet is 477/freq in MHz, or just on 68 feet (20.7m) for the code end of 40m. The far end of this was held up – via a plastic button insulator – by a fishing line launched up into a tree using a half-filled plastic drink bottle. All too easy! 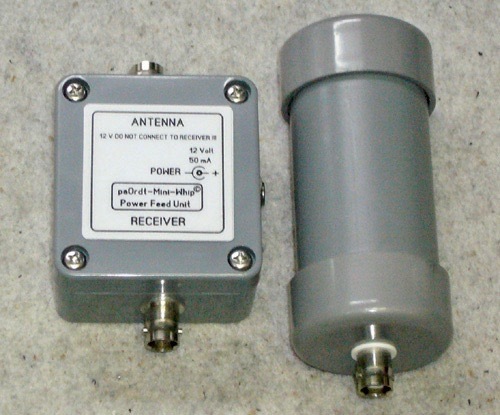 The near end of the antenna simply terminates in a banana plug that connects to the little tuner. I also connected a short 5-6 foot counterpoise, which was essential. I had a great time playing with the tuner and my new SDR-Cube pumping out a whole watt of RF, as well as the trusty little FT-817. Now I have a clear idea of what’s required for an effective little kit of gear to take up a hill for relatively speedy SOTA style deployment. And maybe I’ll fill the water bottle for those trips. If you’re interested in getting hold of one of these nifty little EFHW Tuner kits you should contact Stu KI6J at ki6mwn@yahoo.com. US$27 included shipping across the Pacific Ocean! Fast and very fair! 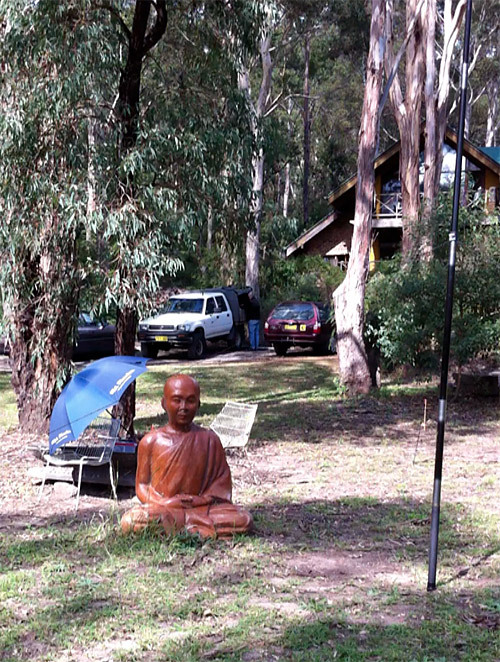 My blissed-out second operator in the field at Bamarang, near Nowra NSW. He helped me retain my QRP calm. During a trip into the township to replenish supplies I found a fishing tackle shop with an Easter sale on, and bought a couple of handy Plano tackle boxes and some inexpensive 10m lengths of nylon coated stainless steel ‘leader line’ wire which I’m sure can be used for a handy weatherproof dipole. As long I don’t have to solder the stuff. Over the weekend sunspot 1112 erupted and produced a strong solar flare. Now according to space weather sites there’s a 25-35% chance of high latitude auroras on 19-20 October. And right now a group of four Norwegian friends are enjoying their annual DXpedition to Kongsfjord – well and truly in the high latitudes – at 70°43′N 29°21′E at the top of Norway. Four of the main participants are Arnstein Bue, from Trondheim, Bjarne Mjelde (host), from Berlevåg, Odd-Jørgen Sagdahl, from Trondheim and Tore Johnny Bråtveit, from Trondheim. As you’ll see if you visit their pages these men are serious medium wave and short wave DXers, with impressive equipment racks and listening achievements to match. As I write this it’s early afternoon there and according to their website it’s warmed up to +4 Celsius! 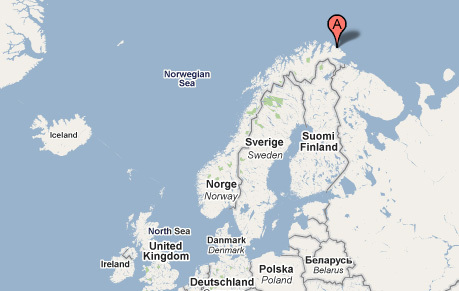 They also appear to operate remotely from this spot. Their antennas include a new 500 metre long Beverage aimed at the North Island of New Zealand which is clearly working very well. Two shorter Beverages (225m & 330m) and a Quad Delta Flag Array complete this dream DXing antenna farm. And if you visit the website you’ll see ample evidence that they clearly know how to enjoy themselves at the dining table as well. Local King crabs are accompanied by the finest New Zealand wines. Their dining notes are as tempting as their DX! Main course was pork sirloin marinated in garlic and chili, served with tagliatelle, basil, leeks and cherry tomatoes. With the pork we tried Kim Crawford’s Pinot Noir. Maybe a bit light for the quite tasty meat, but absolutely a super wine! For dessert we had local blueberries with grappa – another Kongsfjord signature dish! And now we are off to listen to more recordings and prepare for another – hopefully eventful night. The solar indexes are going down and the K-index for Tromsø is now 0, and we hope that it will remain like this! The main website is also the repository of a number of documents on DXing issues by Dallas Lankford. There are also data sheets for a large number of receivers (including AOR, Racal, Rohde & Schwarz, R L Drake Company, Siemens, Harris, TenTec, Icom etc) and information about antennas. Bjarne Mjelde has distilled his experience into a definitive article about the best antenna wire. The conclusion? A thumbs up for galvanised steel and aluminium. A number of his reviews are also aggregated on the site, including reviews of the IC-703 and the Perseus SDR. Their sites demonstrate how much a part SDR plays in modern DXing and monitoring. There are some huge SDR recordings and mp3 files available as well. Retrospective analysis of these files enables them to find rare stations as well as – presumably – traditional live listening. It’s been a delight checking in on their site each day to catch up with the activities of such a convivial group of friends. Truly inspiring to this reader on the other side of the globe. Mads LA1TPA recently visited Julian G4ILO’s shack and was so impressed by his approach to cutting through the QRM using an MFJ-1026 Noise canceler and a pa0rdt-Mini-Whip active broadband RX antenna, he’s replicating the solution at his own QTH. His post links to info on both the MFJ-1026 and the pa0rdt Mini-Whip. 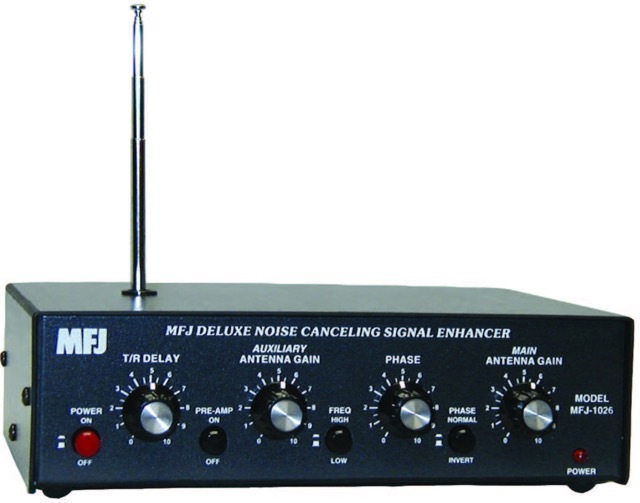 Julian G4ILO’s site has an extensive description of the MFJ-1026 explaining that it’s a noise canceler, not a noise blanker or a noise reducer – as well as a ‘look under the bonnet’. It’s most effective when the noise is coming from a single point source, not multiple sources. So the canceler can reduce noise from a neighbour’s switch mode power supply, TV or computer it may be less successful dealing with general powerline noise. “The MFJ-1026 is expensive for what it contains and quite poorly made, so I don’t feel any pride of ownership of it. It’s also a hassle having to tweak its controls whenever I change bands. But pressing the button to take it out of circuit quickly reminds me just why I have it. You can also preview the MFJ-1026 manual here. “After several fruitless attempts to make an active loop work in a city environment, it was found that the electric field from local noise sources was contained within the house. The magnetic field of local noise sources was not contained inside the house, making weak signal reception at LF impossible. Hence an electric field antenna was called for. 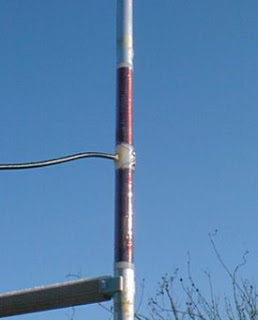 Tests were performed using an active whip antenna, designed by G4COL. Results were encouraging and the whip length could be reduced from 100 cm to 30 cm without loss of performance. It became clear that at LF an active whip is a capacitance coupled to the electric field. It never ceases to amaze me what wisdom is simmering away amongst those email discussion groups I read. Out of the blue today – prompted by mention of a commercial solution on the Elecraft list – came a sequence of brilliant ideas about making effective and easy on the budget ladder line spacers. The commercial spacers from K&S Ham Radio Parts look great, but the fact they’re made of nylon prompted concerns about their survival against UV. At 25 cents a piece I think they look fine! In response there was a pointer to a YouTube video showing how to turn a box of ballpoints into very neat and secure spacers using black cable ties. And then a pointer to another commercial solution from True Ladder Line, and a hint about how to replicate the effect at home using ‘drip sprinkler tubing’ which is the right size and and has just the right amount of rigidity for the job. And there’s Dave ZL1BJQ with his approach based on those plastic chopping boards you can buy at any $2 shop, cut into spacer pieces, notched then pushed on to wires and held in place with hot glue. And then there’s this approach by VK2YE using plastic coat hangers, cut to length (5cms) and drilled to fit wire, and then glued to stay in place. In fact this is just one of 138 videos on his YouTube channel. 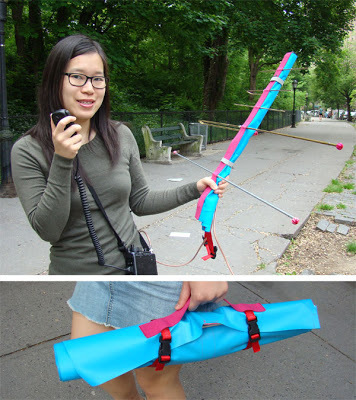 Via Southgate News and MAKE magazine news of a collapsible fabric yagi antenna developed by Diana Eng KC2UHB who has combined two craft skills in a stylish way, electronics and sewing. It’s a design for a Yagi for portable amateur radio satellite operation. Her MAKE magazine article is well-written, comprehensive and brilliantly illustrated. Check the size of the antenna in that earlier piece and you’ll understand why she aimed at something more portable! Via Julian G4ILO I came across a WSPRnet report from DM1RG on his success with a newly built KGD Antenna from the German site QRP Project. I had actually ordered their other antenna project (a Multiband Fuchs antenna that enables a single 41m wire to operate on all 8 HF bands) a few days ago and earlier tonight revisiting their site I was readng more about the KGD antenna – a very small vertical dipole – how’s 130cm for a 30m antenna that enabled a link from D to VK on 5 watts? The Kurz Geratener Dipol antenna is no longer available as a kit but the instructions are still online – auf deutsch. I should also have a go at translating the manual. It seems to be quite an effective design. On the 40m version (pictured here from the QRP project site) – all 150cm of it – the bandwidth between SWR 2:1 points is 45kHz. Reading about the antenna again on the same evening is clearly some kind of good omen? I can almost imagine one mounted bike mobile! I’ve only just discovered the set of video tutorials on YouTube featuring Chris W6HFP of Buddipole. They’re clear and well shot and edited, I suspect by Steve WG0AT. And they’ve been online for over a year! In this one Chris explains setting up a Buddipole Versatee Vertical.